I just love this sentiment (QQ0806-C) from Verses Rubber Stamps - it makes for a wonderful Anniversary card! As a follow up to the project I created the other day in this post, I used the same Heart/Flower combination cut with the eCraft to embellish my card. All images are from the eCraft Fundamentals 1 SD card; the Flower Blossom is cut from Basic Grey pattern paper, the heart is cut from Black and Red card stock and highlighted with Silver rub-ons. Each Friday the eCraft Design Team will be sharing Video projects for the Visual Crafter, click the video below to see how I created my card using the eCraft. (Note DT members will be posting their videos on the eCraft DT Channel, I'll also be uploading to my YouTube Channel.) Click here for an MS Word Document. Using the eCraft to create the embellishment was a super easy, and to save me time in the future, I saved my Flower Grouping. Now all I have to do is open the file, add card stock to the eCraft and cut! I can even resize the flower blossoms to be bigger or small if I'd like. Beautiful! 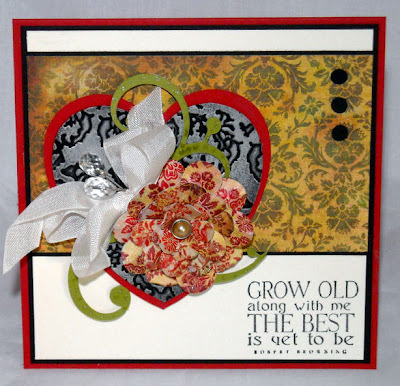 Love the gorgeous flower and embossing! Love that sentiment! So gorgeous! The flower is quite the looker and I do love that sentiment! Happy Friday! You are so amazing, what a beautiful card, just luv that flower! that is a beautiful card, love the color combination and the paper. Thanks for the video tutorial, it's awesome to be able to visually follow along. Wow what a beautiful card and the sentiment is lovely!!!!! Great job!!!!! You make it look so easy! Hey, I also have the pink eCraft machine. Great tutorial, Lisa.